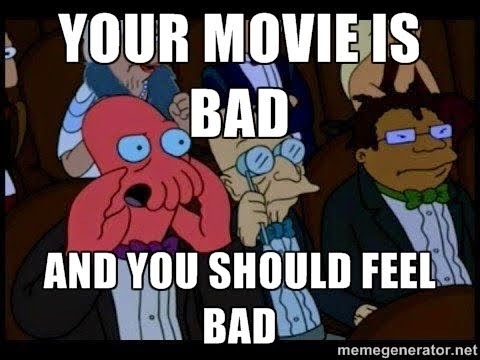 I did not enjoy Kill Bill at all. Couldn't put a finger to the exact reasons until we talked about it. "Guy Ritchie, before he went insane and married Madonna (not necessarily in that order), was one of these." Biggest LOL moment of the day! So glad you wrote this so I don't have to. I agree with everything you said. All I'll add is I was initially intrigued as I thought the movie was going to ask some spiritural/socio-religious questions, but then I realized the whole hearing from god thing was just an excuse to gleefully shoot up a bunch of baddies. I hate this movie. This could have been a really interesting film had its filmmakers had some intellectual curiosity, and had explored WHY two Irish-American losers would go vigilante, and asked some hard questions about what they were really thinking (and maybe what thoughts they might be suppressing). Explore the suppressed true motivations hidden under their supposed divine mandate. Rather than making them cult heroes, pit them against society and make it a study on sociopathy. Make the Willem Dafoe character a sympathetic, understanding figure...who wants to put them behind bars, where they belong. Anyway, good work dude, gonna start following your blog!